After years of decline, a new report reveals that there has been an increase in the number of cyclists killed in motor vehicle accidents since 2010. The Governors Highway Safety Administration (GHSA) released the, “Spotlight on Highway Safety: Bicyclist Safety” report on Oct. 27th. The report shows cycling deaths have increased 16 percent from 2010 to 2012, from 621 to 722 cyclist fatalities. During that time, Massachusetts saw the numbers almost double, from seven cyclist deaths in 2010 to 15 in 2012. The majority of cyclist deaths came from six states, including California, Florida, Illinois, New York, Michigan and Texas. During this period, other deaths in motor vehicle accidents increased by just one percent. Two thirds or more of cyclists killed in 2012 were not wearing bike helmets, “a major contributing factor” in deaths because many cyclists suffer serious head injuries, the GHSA said. Bike helmet use. Citing 2012 Fatality Analysis Reporting (FARS) data, the GHSA report showed 65 percent of cyclists who died in 2012 were not wearing a bike helmet. Meanwhile, just 17 percent of cyclists were confirmed to be wearing one. Helmet use was unknown for the remaining 18 percent. Twenty one states, including Massachusetts, have laws mandating bike helmet use for children. But none requires helmet use for adult riders and the GHSA said use has to be encouraged. In Boston, city officials have raised the idea of mandating bike helmet use. It would not be the first city to do so. 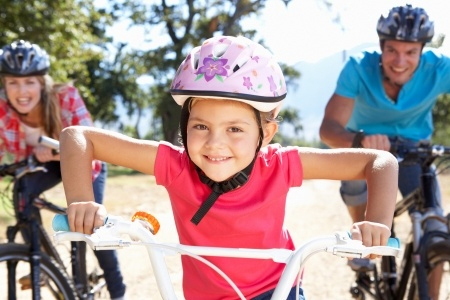 Sykesville, Maryland requires cyclists of all ages to wear bike helmets. But such ordinances are largely controversial. Dallas, Texas passed a law mandating helmets for all ages, but city officials revised it this summer, limiting it to cyclists who are 17 and under. As it stands in Boston, riders of the Hubway bike share must agree to wear bike helmets when they sign up. The City of Boston has actively promoted bike helmet use over the years through advertising campaigns and community outreach programs. Breakstone, White & Gluck has also worked to increase bike helmet use among children in Massachusetts. Over the past two years, we have donated 3,000 bike helmets through community organizations. We are proud of this work and will be back in 2015. Our program partners include: Boston Bikes’ Roll It Forward, a program run by the City of Boston, Worcester Earn a Bike, CYCLE Kids, Cambridge Public Schools, Somerville Public Schools, Bikes Not Bombs, Framingham Bicycle and Pedestrian Committee, East Arlington Livable Streets and Arlington Public Schools, Watertown Bicycle and Pedestrian Committee, Westborough Bicycle and Pedestrian Committee, Somerville Kiwanis, Dedham Bike Rodeo, Boston Cyclists Union, Arlington Town Day, Westwood Bicycle and Pedestrian Committee, Lexington Bicycle Advisory Committee and the Ashland Farmer’s Market and iCan Shine Camp of Arlington. State safety efforts. The GHSA touched on safety improvements which communities can make and strongly encouraged development of cycle paths. These go a step further than traditional bike lanes and physically separate motor vehicle traffic from cyclists on the road with flexible posts or other safety measures. If communities cannot add cycle paths, the GHSA suggests adding marked bike lanes, bike boxes which designate space in a lane for bikes at intersections, and separate bike traffic signals with advance lights for cyclists. Boston has a 5-year action plan to build 21 miles of cycle tracks in various areas of the city. The Boston personal injury lawyers at Breakstone, White & Gluck have over 100 years combined experience representing clients who have been seriously injured by the negligence of others. Learn more about our bike helmet safety program and our safety resources. To consult with an attorney, contact us at 800-379-1244 or 617-723-7676 or use our contact form.